Many novice hand-loaders believe that neck bushing Inside Diameter (ID) size is the only important factor in neck tension. In fact, many different things will influence the grip on your bullet and its ability to release from the case neck. To learn more about neck tension and “case grip”, take the time to read this article carefully. We bet you’ll gain knowledge that will let you load more accurate ammo, with better ES/SD. While we certainly have considerable control over neck tension by using tighter or looser bushings (with smaller or bigger Inside Diameters), bushing size is only one factor at work. It’s important to understand the multiple factors that can increase or decrease the resistance to bullet release. Think in terms of overall brass-on-bullet “grip” instead of just bushing size (or the internal neck diameter in non-bushing full-length sizing dies). 2. Amount of bullet bearing surface (shank) in the neck. 4. Length of neck (e.g. 6mmBR neck vs. 6mm Dasher). 9. Time duration between bullet seating and firing (necks can stiffen with time). 10. How often the brass is annealed. 11. Amount (length) of neck sized (e.g. you can size only half the neck). 12. Interior diameter of bushing, or neck section of non-bushing die. 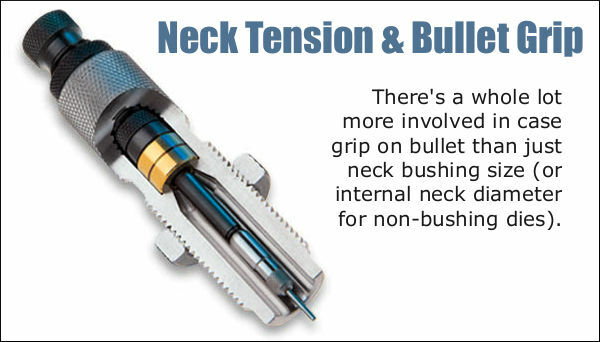 One needs to understand that bushing size isn’t the beginning and end of neck tension questions, because, even if bushing size is held constant, the amount of bullet “grip” can change dramatically as the condition of your brass changes. Bullet “grip” can also change if you alter your seating depth, and it can even change if you ultrasonically clean your cases. Share the post "Case Grip on Bullet — There’s More to Neck Tension Than Just Bushing Size"
Forum member Alex W. (aka “zfastmalibu”) came up with a clever adaptation of an item you may already have on your kitchen counter. By drilling a few strategically-placed holes in a wood knife-holding block, Alex created a handy, 20-round ammo holder for the bench. We’re not sure the wife will appreciate the new holes in her kitchen accessory, but we think this is a smart invention. Alex asked fellow Forum members: “What do you think, is there a market for it?” We think there is. Of course, with a ruler and an electric drill you could probably make your own version easily enough. 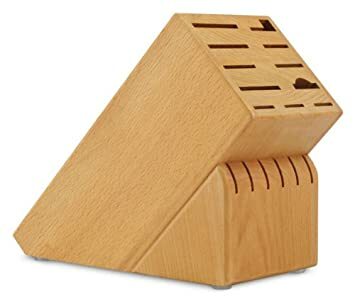 Hardwood Knife blocks can be purchased for under $25.00 through Amazon.com. They are also available in bamboo ($18.14), beechwood ($39.95), acacia ($49.95), and solid walnut ($59.95). Share the post "Make Your Own Ammo Caddy with Wood Knife-Holder Block"